Obama's White House photographer has been throwing shade at Trump on Instagram for weeks. Pete Souza, former chief official White House photographer for President Obama and Ronald Reagan, has been throwing some (not so) subtle shade at President Donald Trump on Instagram. How's he doing it? Souza is reposting some very specific images from the Obama administration any time the new president makes a controversial decision. Is the timing a coincidence? Probably not. Let's take a look. First, Souza criticized Trump's interior decorating skills by posting this picture with the caption "I like these drapes better than the new ones. Don't you think?" 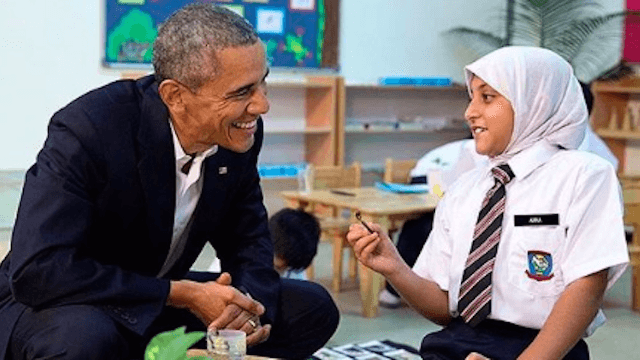 When Donald Trump issued his controversial Muslim ban, this picture of President Obama talking with a young refugee was posted. Hm, impeccable timing! As Democrats and Republicans warred over if they should appoint Jeff Sessions as Attorney General despite his troublesome racist past, this photo popped up. Sessions was confirmed by Congress on Wednesday. 2011. President Obama talks with then Sen. Jeff Sessions after an event for the Alabama Crimson Tide football team. Sessions is now the nominee for Attorney General. After Donald Trump nominated ultra-conservative judge Neil Gorsuch to the Supreme Court, Souza reminded us all of President Obama's pick, Merrick Garland. Garland was blocked by GOP leaders from taking the seat left empty by the late Supreme Court Justice Antonin Scalia. Last week President Trump tried to start a beef with Australia on Twitter. Then Trump ended a call with the country's Prime Minister prematurely by hanging up on him and calling it was the "worst call by far." Coincidentally, Souza uploaded this picture of President Obama with Prime Minister Malcolm Turnbull. Remember when Trump's team couldn't figure out how to turn on the lights in the Cabinet rooms so they were forced to work in the dark? Souza remembers, and posted this picture with the caption "those damn lights ;)." After billionaire Betsy DeVos was confirmed as Secretary of Education, Souza posted this picture of President Obama in a pre-K classroom. Souza launched his personal account, @petesouza, right after President Obama left office (you can also check out his professional account, @petesouza44). Keep trollin', Pete.